I'd like to tell you that my my kids and I spend a leisurely afternoon crafting theses cute last minute valentines. But I would be lying. We were a little late to the classroom Valentine's Day party....Yesterday afternoon I had a super fun and last minute Valentine's Day craft idea that I thought my super creative 12 year old would love. I pulled out all of my extra heart foam stickers, craft paper, and even some mini doilies. 2 seconds later I had a super cute last minute valentine idea. Sadly, my daughter said that candy is currency in her workshop class and asked if we could go to the store and pick up some "fun dip" to hand out. Cue forehead slap. I did get a "but they are really cute, maybe we can give them to my workshop teachers?" 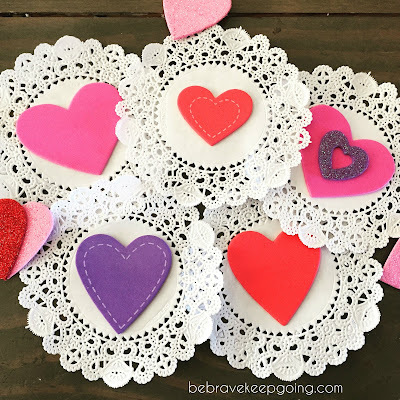 If you want to make these, it's pretty simple and they would make cute and easy valentines gift tags. One package of paper doilies and 1 package of foam heart stickers.